I was looking for a synth module I can run from my computer with MIDI so I can add some pads and arpeggios to songs. so I got this for $50 on eBay. It's an old 80s synth similar in sound to the DX-21, DX-27, and DX-100 yamaha synths. It uses FM synthesis technology first introduced with the super popular DX-7. yamaha's proprietary chips used in these (they held patent rights for FM synthesis from 1975 to 1995) are very similar to other ones they made for arcade machines and video game consoles. for example the sega genesis/mega drive uses a slightly later generation yamaha FM chip that added PCM processing. of course I don't really need the PCM processing, I just want the awesome 80s synth sounds! that's awesome. when i had my dx-7, i really wanted to track one of these down to use in conjunction. I never heard of this unit, great post man. Sounds cool. So, would you use that with a midi keyboard? How is it setup? yeah, you can use it with anything that sends MIDI information; keyboard, sequencer, computer, MIDI guitar pickup (seriously considering this! ), etc. you plug in the associated MIDI cables and then you can just select a voice setting and just play with your keyboard or sequencer; or you can setup a configuration that uses multiple voices. you can assign up to 8 chosen voices to specified MIDI channels and note ranges. so you can have like drums on one, bass on another and brass on another or something and then control it all with a sequencer. or by just setting them to different note ranges and octaves you can split a keyboard up into multiple instruments. it has 8 note polyphony (if you get a second one you can put them together for 16 note polyphony). you have to share those 8 notes with the however many voices you've setup. So I did a little research into these when I was considering the eBay auction and I've since done a lot more. It seems there is some common misconception about the origin of this synth. The casual assumption is that it comes from the same line as the DX-21 and DX-100, however, this is not entirely the case. Although it is a similar "4 OP" FM synth, it is not based on either of those synths. Even otherwise very knowledgeable synth guys seem a bit perplexed about where this little guy fits in with the Yamaha synth line. Well I've done a bit of research and came up with an answer. 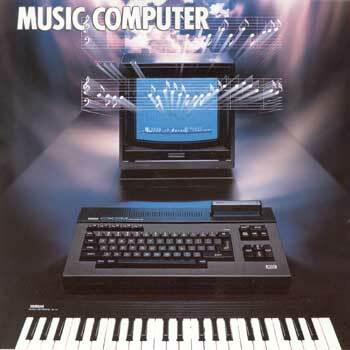 This is the Yamaha CX5M Music Computer. At it's simplest it's an MSX computer compatible with all MSX software and games (it's the computer that Metal Gear was first released on) but with the addition of an add-on sound module incorporated into the design of the computer, known as the SFG-01. Later they moved to the SFG-05; they updated the chip and added some additional software functionality. There are quite a few music programs Yamaha made for this computer (if you get an MSX emulator, you can find all of the Yamaha ROM images) but your access to the sound module was still somewhat restricted. Yamaha really only intended people to use the computer in support of their other synths, they didn't want to give it all away with a single all encompassing unit. So finding other ways to market the technology they came out with the the FB-01, basically a standalone version of the SFG-05. They later used the same technology again for a soundcard for IBM PCs, known as the IBM Music Feature Card. The tricky thing with this unit is editing the voices. This can only be accomplished with computer software. It looks like it's going to be a bit of a task finding software for it on OSX. Someone has made a Windows editor and there is an old DOS editor as well. Of course Yamaha made one for the CX5M. Someone made one for the Amiga and there seems to be a handful made for the AtariST (it seems like that computer was extremely popular with musicians in Europe). You could use Emagic's Sound Diver to edit it on OS9, but since Apple bought Emagic they stopped development of Sound Diver. The stupid expensive MIDI Quest software seems to support it and is currently available for all major OSs. I'm not about to pay $400 for a piece of software to edit a $50 synth. I think for now I'll just see how things will go with the DOS editor running in DOSBox. If anyone's interested, THIS GUY had one listed as well that I was looking at and he's just relisted it and dropped the price. Even cheaper than the one I just got! Also, there's this TX81Z (the big brother of the FB-01) that someone's listed wrong and is going for cheap. EDIT: wait, there's more! so I wrote up a quick comparison of Yamaha 4 OP synths HERE, so you can see where this falls in with the rest. Thats pretty sweet, I'm tempted to get something like this as I've got a m-audio keystation that is living under my bed and it'd put it to good use if I had something like that. yeah, I would totally scoop that up from ya but the overseas shipping makes it not so much worth it. this is a bit niche info but I have been digging around the interwebs for patches for this thing and found quite a bit of really good ones. I was able to convert a lot of DX-21 patches to work with the FB-01 as well. the factory set DX-21 patches are much better than the ones that come on the FB-01.